Elise Witt is a person who is driven to make the world a better place through music and the performing arts. After being born in Switzerland and spending her early childhood in upstate New York, Elise was raised in the southern U.S. state of North Carolina and since 1977 has made Georgia her home. Her mother used to sing in a choir in Switzerland and Elise carries on that singing tradition. Her main interests through her school years were languages of the world. She would study this in college and is fluent in French, German, Italian, Spanish and English. Throughout her professional career in the arts, Elise has been gathering songs in different languages from all parts of the world. She shares this knowledge of culture in the many community projects that she is associated with. Having a great reputation as a vocal instructor, she thrives on taking this ability to helping the less fortunate in society. Examples of the projects she is involved with include: “Alternative ROOTS“, “Global Village Project“, “An Impromptu Glorious Chorus™”, “All The Way In” and more. 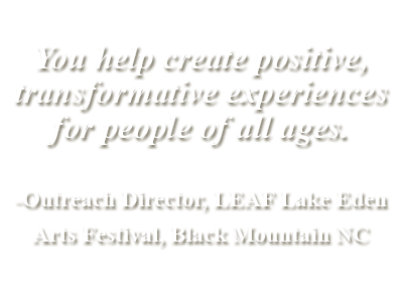 These are organizations that help people grow through the arts. In her performance life, Elise has many successful performing and recording projects. She was a member of The Robert Shaw Chamber Singers which played Carnegie Hall on a regular basis. Her various groups and joint ventures have brought well-polished music all over the U.S., as well as the world. Elise has served as a cultural ambassador to South Africa, Nicaragua, China, Italy, and Yugoslavia. I recently had the opportunity to speak to Elise about her wonderful career. R.V.B. – Good morning Elise… how are you today? E.W. – I’m well… how are you? R.V.B. – I’m good. We have a nice hot day up here. How is it down by you? E.W. – It’s actually been an amazing summer. It’s been kind of cool for Georgia. It’s been raining everyday and my garden is exploding. R.V.B. – You don’t sound like you’re from Georgia? E.W. – I’m originally from Switzerland. We moved to upstate New York near Syracuse when I was 4 and lived there for 10 years and then moved to North Carolina. I’ve been in the Southeast since 1966. R.V.B. – Thank you for taking this time with me. Your resume is very impressive. When did you start singing? E.W. – I probably started singing before I was born. My mother was singing in a choir in Switzerland when she was carrying me. They say that I sang before I started talking, so I’ve been singing all of my life. I’ve always loved singing but I never thought about doing it as a career. I was really into languages and I didn’t want to ruin the joy of singing by studying it. I always did music for pleasure. I was a French Major in college and I studied in France for a year. I was all set to be a translator, or interpreter, but then I got sidetracked into theatre. The kind of theatre I got sidetracked into was theatre reflective of community. I read an article that intrigued me about playwright Rebecca Ranson. Do you remember Joanne Little and the song Sweet Honey in the Rock wrote about her? She was in jail in Washington, North Carolina for defending herself against sexual assault by a guard and Rebecca Ranson was doing theatre with the women in the prison there. Rebecca’s work gave me a revelation about the arts: there are two things called “Theatre.” One is purely for entertainment, while the other is for communities to tell their stories. I ended up meeting Rebecca, and acting in a play she was writing called “Desperados”. It was a powerful experience, which led me to an organization called “Alternate ROOTS“. ROOTS became, and still is, my artistic family. ROOTS is a coalition of artists who work at the intersection of arts and activism. I found out about them in 1979 when the organization was just a year old. Through the artists I met in ROOTS, I realized I could make a living making music. I wanted to contribute to change and connect to people through my music. I learned how theater and dance companies do their work through residencies and creating relationships with the communities where they are working. So I began working in schools and community centers, teaching classes, writing songs, and organizing concerts. It was a way of sustaining myself as an artist and doing work that left an effect on the community. R.V.B. – It’s the best of both worlds. You’re doing something you like and you’re doing it for a good cause. E.W. – I’m one of the luckiest people in the world because I’ve made my entire adult living as a singer. At ROOTS, I met some folks from Roadside Theatre in Kentucky, and they said “What is something that you have to offer that is unique to you?” I speak five languages fluently so that became my “hook.” I created “A Musical Trip Around the World,” which I took to schools and communities all over the South and beyond. I taught songs from many different cultures and created new songs to address concerns or tell stories about community life. It was a combination of getting kids and adults excited about global music, and also writing songs about what they were studying or interested in or concerned about. A few years ago I was at Lady’s Island Elementary School on Lady’s Island in South Carolina, where the Gullah/Geechee culture is alive and well. They wanted me to write a school song with the 4th graders. The school mascot is the osprey. There are osprey nests in the lights of the sports fields… so the osprey was a part of the song as were some lovely phrases in Gullah. We wrote a song with 17 verses, and of course the students memorized all 17 verses because they had created it, and we performed it at a big community festival. It’s just been a really interesting trajectory for my music. You were involved with the Robert Shaw Chorale? E.W. – I sang with Mr. Shaw for around 20 years. Mr. Shaw moved to Atlanta, and became the conductor for The Atlanta Symphony Orchestra (ASO). He also conducted the ASO Chorus and Chamber Chorus (ASOCC) – I was in both. Mr. Shaw revolutionized choral music. He played the chorus as his instrument. The techniques that he developed to conduct a chorus are now used by choral directors around the world. He was an amazing man. When I went to Nicaragua with my band in the 80’s, we raised all the money for the trip, and Mr. Shaw and his wife were among the supporters. He was very socially engaged and outspoken. R.V.B. – I’ve read a lot about him and it was obviously great for the city of Atlanta for him to move down there and set up shop. E.W. – Absolutely. It was like having a fantastic voice lesson every Monday evening! R.V.B. – You performed outside of Georgia with Mr. Shaw, right? E.W. – Yes. The Robert Shaw Chamber Singers, which I was also in, was the resident choir at Spivey Hall, here in Atlanta – for a few years. And we did a yearly series at Carnegie Hall in the ‘80s and ‘90s. Mr. Shaw passed away in 1998 right after my father passed. It felt like losing two fathers, two mentors. R.V.B. – I’m sure playing at Carnegie Hall was a great honor for you. E.W. – Unbelievable… walking into that space. You know how a musical instrument gets better with age? It absorbs the music into the wood… the guitar, cello, violin. In Carnegie Hall, I literally felt the years of music that were in the walls. It was palpable. I’ve never felt anything like that before. It was so exciting singing there. We were there many times but the excitement never diminished. R.V.B. – Certain places have that aura, like the Ryman theatre in Nashville. E.W. There are also a lot of lesser-known places like that in small towns around the country. For example, in the ‘80s I was touring with my band “The Small Family Orchestra” and we were on the roster of the Southern Arts Federation. Thanks to that connection we played in many beautiful and “unknown” places around the Southeast. One place that stands out in my memory is the Fort Payne Opera House in Alabama. It’s a gorgeous space and there are quite a few treasures like that in the South. They have that magic from the music that’s been played there. Of course Carnegie is in a category of its own. R.V.B. – I see that you were involved with the Clearwater Festival. It’s a beautiful setting for a festival. E.W. – The Clearwater Festival was wonderful. You know they built the Sloop Clearwater to help clean up the Hudson River. So in addition to the Festival, they initiated the Pumpkin Sail. Every October the Sloop Clearwater would spend 3 weeks sailing from Albany down the Hudson River to New York City. On weekdays the boat would stop in the towns along the river and all the 4th graders from nearby towns would come and learn about the ecology of the river. The students would sing and hear the Stone Soup story, and then get to eat stone soup. There were musicians, jugglers, storytellers and clowns on board. My clown friend Stephen Stearns – founder of the New England Youth Theater – is the person who hooked me up with the Clearwater. It was so much fun. We sailed silently. Each weekend there was a festival. The first weekend was in Albany, the final weekend was in New York City and during the middle weekend the festival was in Beacon, where Pete and Toshi Seeger lived. At the festival in Beacon, Pete and Toshi were cooking and serving chili for the crowds! R.V.B. – They were amazing people. E.W. – Yes! I wrote a song with Pete. He wrote the words back in 1968. He went on a camping trip with his youngest granddaughter to an island in Maine. When they got there, there was a lot of trash on the beach. He was appalled and wrote a poem on a rock there. So the poem existed, and then Jim Musselman – his publisher – wrote some more words to it and they published it. Studs Terkel recited the poem on the CD Where Have All the Flowers Gone? It’s a compilation album with different musicians singing Pete’s songs. In the liner notes, Pete told the story about the camping trip and he said “I never found any music to this one so if you hear anything, go ahead.” In 2007, at the Folk Alliance Conference, the traveling musicians’ Local of the Musicians’ Union, Local 1000, organized a celebration for Pete’s 88th birthday. I wrote to Pete and asked him if he would approve the music I had written for his poem. We had a beautiful correspondence. His cards and letters are signed each with his little banjo sketch. We corresponded back and forth about four times. He liked the music and said “OK”. That was very thrilling. The song is called “Blessed Nation.” I recorded it on my CD “Valise,” and it has banjo on it of course! R.V.B. – What a wonderful story. The letters are a nice keepsake. You did some cultural ambassador work and you’ve traveled quite extensively. Can you give me a few travel stories? I’ve spent a lot of time in Italy. Back in the ‘80s, the City of Atlanta Bureau of Cultural Affairs (BCA) provided a lot of public funding for the arts. I had moved to Atlanta to start an ensemble theater called “The Theatrical Outfit.” We wrote all our own plays, and lived together in a big group house. The BCA awarded us two salaries as Artists-in-Residence, which we split 12 ways! The BCA invited three artists from Italy – painter/sculptor Michelangelo Pistoletto, theater artist Lionello Gennero and jazz trumpeter Enrico Rava – to work in Atlanta for a month. The BCA basically said “Any Atlanta artists who want to work with the Italians… here they are.”So my theatre company adopted Lionello, the theatre director, to do theater at the youth detention center, where we were working. All that month we would go over to where the Italians were staying and have these amazing dinners and cultural discussions. At the end of their month in Atlanta, there was a big performance called “Chair Stations,” directed by Michelangelo. All the artists that had been involved in the project were part of the production. Clark Atlanta University jazz band had been working with Enrico. And a lot of visual artists had done collaborations with Michelangelo. It was a wild kind of performance art “Spettacolo.” Then the Italians invited five of us from the Theatrical Outfit to come to Italy for the other half of the collaboration. So in the summer of 1979, I went to Italy with four of my theater colleagues. I had never been to Italy but I knew Paolo Zacchera, a young man who had been an exchange student in Valdosta Georgia, while I was living down there. So I wrote to him and said “I’m coming to Italy with some friends. Can we come and visit you?” He promptly replied, “Yes… come, bring all of your friends and stay as long as you want.” He was starting a farm to raise azaleas, rhododendrons and camellias. We went to Lago Maggiore and stayed with him, where we were wined and dined, and then proceeded to Corniglia in the Cinque Terre, to join the Italian artists. There we created a wild performance on the three piazzas (town squares) perched on the steep mountainside over looking the Meditteranean Ocean. Everybody in the town – all of the sheep, all the children, all the adults were in the performance called “Opera Ahhh.” It was another grandiose “Spettacolo.” I wanted to return to Italy, and being the language fanatic that I am, I couldn’t go back without speaking Italian. So when I got back to Atlanta I enrolled in a class at Emory University. The teacher was from Rome and excited that somebody actually wanted to learn. For the next several years, I spent three to four months of the summer touring with my friend Laura Culver. She played cello, soprano saxophone, and the Brazilian berimbau. I played guitar and sang. Our duo “Hero Sandwich” had a really bizarre and eclectic repertoire. For example, Heitor Villa Lobos wrote “Bachianas Brasileras” for 8 cellos and voice, and Laura re-arranged it for 1 cello and voice. We did Mose Allison’s “Everybody’s Crying’ Mercy”, and of course a Pete Seeger song. Every time we played a concert, there would be somebody in the audience who would invite us to another gig. Once we played on the Adriatic coast where glamorous super models from around the world were showing the latest fashions in belts and hats. We would work on Paolo’s azalea farm on Lago Maggiore in exchange for room and board, and then go off and do our gigs. It was wild and wonderful. I’ve made lifelong friends in Italy and still continue to go there as often as I can to visit, play concerts, and teach workshops (in Italian!). R.V.B. – America has studio-manufactured music now. If you don’t sound like that, then you can’t sing. E.W. – Exactly. My workshops are a combination of a vocal workshop and a community sing. They are “low pressure and high pleasure,” open to singers of all styles and experiences, and I teach everything by ear, so there is no music reading. 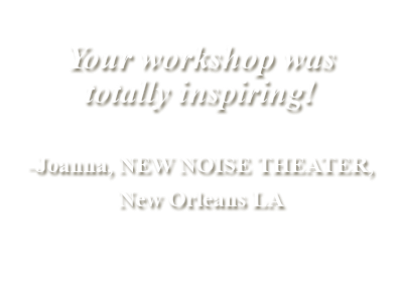 When I tour, I do concerts as well as workshops, and I often invite my workshop participants to sing on the concert. R.V.B. – I gather you do these workshops in Georgia also. E.W. – At home I teach class series, usually 6-8 weeks, so that we can go deeper into the music. I moved to Georgia in 1977 to start the Theatrical Outfit with a group of 12 artists – dancers, actors, directors, musicians. We just said “We’re each going to teach the others what we know how to do.”And to me they said “You’re gonna teach us singing.” I had never taught before, but I had had great music teachers all the way through public school and on into college. And then our theater decided to start offering classes to the public. So that’s how I started teaching these community singing classes. I originally called it “Singing for the non or quasi singer.” But of course I realized that title is diametrically opposed to my philosophy. There is no such thing as a non-singer! We’re all singers! 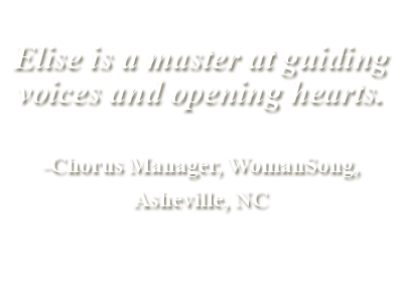 So now my workshop is called An Impromptu Glorious Chorus™, and it’s been growing and evolving over the last almost 40 years. There’s a group of people that have been singing with me for years – and then new people come in – but it doesn’t start over every time a new class begins. It’s a kind of continuum… new people just fit in to where we are already. It’s like collective memory. I’ve had this same experience in my own learning. I’ve been studying with Rhiannon, who sings in Bobby McFerrin’s Voicestra. Rhiannon is a powerful performer and teacher. She’s been teaching for more than 40 years, and in 2008 she decided that she wanted to go deeper with her students. She started a program called “All The Way In.” It’s a year-long program for 16 singers from around the world who work together for a year. I was in that first group in 2008, and we met in three different places over the course of the year. We would have phone or skype meetings in-between gatherings. We studied vocal improvisation, which is the core of the program, as well as sound healing, collaboration, and performance. And then for the 2012 All the Way In, Rhiannon invited me to be a co-pilot, to help her hold the circle and to be mentored as a teacher. All the Way In was a life changing experience for me – vocally, compositionally, spiritually, collaborationally. Since 2008, the community of improvisational singers has grown exponentially, and I notice that, like in my classes, each group starts where the last group left off. The ever-growing group of singers is on the same trajectory and moving it forward collectively. The singers continue to be connected and form collaborations around the world. There is so much happening with community singing. Group singing has really exploded in recent years. R.V.B. – The Arts have a lot of powerful benefits. You represented the state of Georgia at the 25th Anniversary of the Kennedy Center. E.W. – Yes, one of our Georgia Senators nominated me. The Kennedy Center has a wonderful program called “The Millennium Stage.” They provide music every single night of the year and audiences can enjoy the music for free before they go to a main stage show. After I played at the 25th anniversary (a different state was highlighted over 50 days! ), I was invited back to play on the Millennium Stage a couple of times. I love working with other musicians and artists in other disciplines, and I have collaborators all over the country and abroad. At the Kennedy Center, I invited Ralph Gordon, a wonderful bassist from West Virginia, and my tap dancing friend Ann Kilkelly from Blacksburg VA to join me. At the time I had just recorded my album Open My Window – and there was a song on it called “Too Busy For The Blues.” I asked the audience if anyone would like to come up and jam with us. This guy came up and soared – we had so much fun. Actually I always collaborate with the audience at my concerts. I try to slip up behind them, so that they’re singing before they realize it. I know there are a lot of people who say “Oh, I hate sing-along’s. I don’t want to do that.” But I have sneaky ways to get them singing, and before you know it, the whole place is making music together. Have you ever seen Bobby McFerrin in concert? R.V.B. – Only on YouTube videos. E.W. – He doesn’t say a word. He just looks at the audience. He’ll divide the audience in half and give a melody to the right side and a counter melody to the left side. Then he conducts them and improvises over the whole. Not a word is spoken… it’s all music. It’s bodies to bodies, voices to voices, communicating. I’ve learned from so many great teachers. Dr. Ysaye Barnwell is the bass singer in Sweet Honey in the Rock. I started studying with her in 1985 at the Augusta Heritage Workshops in West Virginia. She is a great composer and an expert in African American vocal music – and some African music as well. She has been an important mentor for me in the way that I teach. At Augusta I also got to study for a week with D.L. Menard, who passed away recently. He is known as “the Hank Williams of Cajun Music,” and is a wonderful songwriter and hilarious story teller. His song “La Porte en Arriere” (the Back Door) is a Cajun classic and we learned all 4 verses of tongue twisting Cajun French with him! I’ve also studied extensively with Fred Onovwerosuoke, fondly known as “Fred O.” He grew up in Ghana, his parents are from Nigeria, he has traveled all over the African continent, and he speaks a million languages. He’s truly a walking encyclopedia of African vocal music, not to mention that he converses freely about Stravinsky, Chopin, and Hank Williams! He was on my faculty when I coordinated “Sing & Swing Week” at the Swannanoa Gatheringin North Carolina. The Gathering offers week-long programs where adults and families can come and study music based in Appalachian traditions. Sing & Swing was about community dancing, singing, and music making. After lunch everyone would join the African Chorus led by Fred O. Suddenly the whole room is in harmony, and you’re part of this incredibly beautiful experience. I always say that when you are singing harmony, it’s 1 + 1 + 1 +1 = 1. Singers do a lot of “polychotic listening,” listening to many things at once. First we focus on our own voice – melody, rhythm, words. Next, our listening allows us to create a perfect unison with the other singers on our voice part. Then we open our ears to simultaneously hear what the other voice parts are doing. And then if we can, that last magic step is hearing the totality of the music, how all those pieces come together. When I’m teaching, I let people step into the center and silently listen, to move their ears around so they can hear the different parts. They hear how everything comes together as one song. R.V.B. – It’s really amazing work that you’re doing. You’re a treasure down south. You’re well rounded in your teachings. You also help the less fortunate. E.W. – I’m a lifelong learner. I’m always learning from inspiring teachers. Currently I teach at the Global Village Project (GVP), a special purpose accredited middle school here in Atlanta for teenage refugee girls with interrupted educations. The students are from Afghanistan, Burma, Congo, Iraq, Ethiopia, Eritrea, Malaysia, Nepal, Somalia, and Syria. I use singing to teach English – our whole curriculum is about language acquisition. I teach them songs from the global peace and justice repertoire. We learn songs from the students’ cultures. And we write songs about things they are studying or subjects that grab their interest. I collaborate with other teachers to see what they’re teaching and we write songs about it. We’ve written songs about fractions. We’ve written songs about the water cycle. We’re now going into our ninth year and the school is becoming a model for teaching this particular population because there is a huge need. It’s really powerful. There was a small group of people who started GVP, and I sort of made up my job at the beginning. In the early years I raised my own salary. But now we are creating an arts-infused curriculum. We have drama with Playmaking for Girls, which is part of Synchronicity Theatre. Last year we had a wonderful Poetry Residency with slam poetry champion Theresa Davis. Our guests have included Czech circus artist Tomas Kubinek, Syrian American hiphop artist Omar Offendum, singers Terry Garthwaite, Becky Reardon, and Leah Song from Rising Appalachia. So much cool stuff is happening at the Global Village Project, so that is where a lot of my teaching energy is focused now. R.V.B. – Do you have any other hobbies? E.W. – I love swimming outdoors. I grew up swimming in a farm pond, and now I swim everyday because I live in a community with a little lake. When I feel the water around me, all my cares drift away! 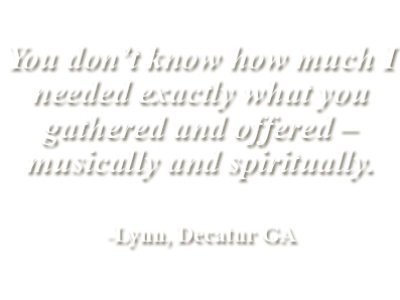 I love to dance to live music – Zydeco and Cajun, Swing, and free form rock and roll dancing. I’m also a big gardener. I have a huge garden, and right now there is an explosion of tomatoes, squash, peppers, eggplant, beans, and flowers. I grew up on a farm, so I’m still a farmer at heart. I’m a singing farmer! R.V.B. – Very nice. I have a big garden myself. Thank you very much for talking with me. You do fantastic work and I’m sure you’re appreciated in the community. You have so many positive things going on. Any other projects? E.W. – Yes! 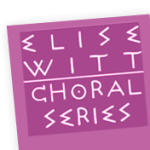 Michael Holmes, the Music Director at the Unitarian Universalist Church in Silver Spring MD and I have created “The Elise Witt Choral Series.” He has arranged over 20 of my songs for mixed choirs (SATB), women’s choirs (SSAA) and men’s choirs (TTBB). I’ve had some impressive choral groups perform my music, including Cantus, The Three Altos, and Malcolm Dalglish’s Ooolation Singers. Sometimes I am invited to do residencies with choruses, which is really fun. I hear my songs performed in full voice, and I get to solo with the choir, and conduct. Another project that is really rocking my world is the trio “Natural Rhythms” with Terry Garthwaite (from the Joy of Cooking Band) and Becky Reardon (great songwriter from Taos NM). We met at a gathering of community song leaders who also write songs for community singing. The 3 of us hit it off right away, and now tour doing workshops and concerts of our original music. Working with them has really kicked my songwriting up several notches, and Terry helped me produce my most recent CD. Our three voices are super, super different, but when we sing together, there’s this magical synthesis. R.V.B. – Have you done any writing this summer? E.W. – I’m having a very quiet summer. I do a lot of my writing at the Hambidge Center for Creative Arts and Sciences, a retreat center in the mountains of north Georgia. 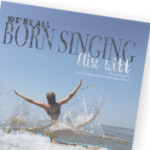 Most of the songs on my most recent CD “We’re All Born Singing” (Photo – We’re All BORN SINGING CD cover) were written there. R.V.B. – Sounds like a nice writing retreat. Thanks for taking this time with me. As I said when I first contacted you, I saw your ad in a back issue of Sing Out. E.W. – I know… that’s funny. R.V.B. – I was thumbing through the magazine and I thought “This looks interesting…” and here we are! E.W. – Thank you so much.